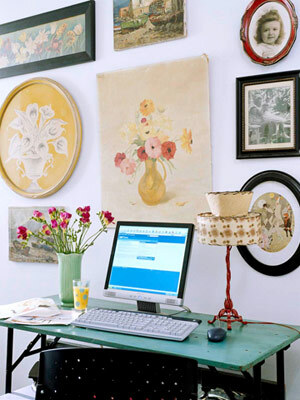 Using frames of different shapes and colors creates a chic eclectic look for any space. Can I favorite this page? I want my work area to look EXACTLY like that. That's an absolutely gorgeous montage. Yeah, I want my work area to look as this. I love the colors. I love it. I read somewhere else that this is a good idea for "hiding" an unslightly thermostat.